American Ella Durran has had the same plan for her life since she was thirteen: Study at Oxford. At 24, she's finally made it to England on a Rhodes Scholarship when she's offered an unbelievable position in a rising political star's presidential campaign. With the promise that she'll work remotely and return to DC at the end of her Oxford year, she's free to enjoy her Once in a Lifetime Experience. That is, until a smart-mouthed local who is too quick with his tongue and his car ruins her shirt and her first day. 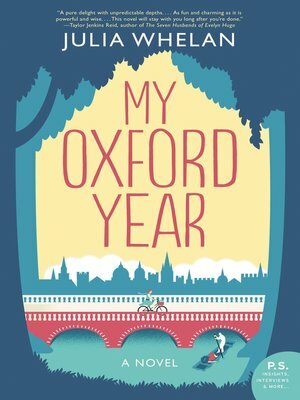 When Ella discovers that her English literature course will be taught by none other than that same local, Jamie Davenport, she thinks for the first time that Oxford might not be all she's envisioned. But a late-night drink reveals a connection she wasn't anticipating finding and what begins as a casual fling soon develops into something much more when Ella learns Jamie has a life-changing secret. Immediately, Ella is faced with a seemingly impossible decision: turn her back on the man she's falling in love with to follow her political dreams or be there for him during a trial neither are truly prepared for. As the end of her year in Oxford rapidly approaches, Ella must decide if the dreams she's always wanted are the same ones she's now yearning for.